Fight for a new home. "Every great moment in our history began with a dream. Each bold leap forward was achieved by those willing to do anything to attain it. We are, all of us, leaving behind families, homes, the very birthplace of our species. Some for discovery, to see the unknown. Others, for a new start. But today, whatever our reasons, we take the first steps toward a new future for humanity. Today, we begin to make our dream, reality." 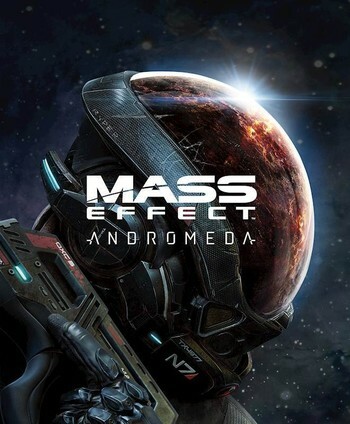 Mass Effect: Andromeda is the fourth game in the Mass Effect series. Developed by BioWare Montreal, it was released for the PlayStation 4, Xbox One and PC on March 21, 2017 in North America and March 23, 2017 in Europe. Players can choose to play as either Scott or Sara Ryder, the twin children of Alec Ryder, members of the Pathfinder team for humanity's ark, the Hyperion. After arriving in Andromeda, an incident forces the chosen Ryder sibling to take on the mantle of Pathfinder, and continue their mission to explore the Andromeda galaxy in search of new home worlds. Titan Books published three semi-prequel novels, starting with Mass Effect Nexus Uprising in March 2017 followed by Mass Effect Initiation in November 2017 that flesh out the Andromeda Initiative and the events that led to the state of the project at the start of the game. They were then followed by Mass Effect Annihilation in November 2018 that told the story of the ill-fated quarian ark and how exactly it ended up in Andromeda. The game reintroduces vehicular gameplay to the series, after the all-terrain vehicle was dropped in Mass Effect 2 and Mass Effect 3. It also returns to a Wide Open Sandbox model, featuring a number of central planets that serve as mission hubs and dungeons all in one. A great deal else is unique to Andromeda, however. Ryder has access to every ability in the game at all times, and can customize their skill build to their heart's content; in conjunction, the classic six character classes are now "Profiles" that give corresponding bonuses, which can be swapped on the fly. The Karma Meter is gone entirely, replaced by a more roleplaying-oriented system that lets the player choose between four moods (emotional, logical, flippant, professional) as they see fit. Finally, Item Crafting and Vendor Trash make their entries into the series, the former allowing for enhanced customization of weapons and armor.